As this game forms a miniseries, with several missions presented as single episodes that are at best weakly connected to each other, I am going to comment on them separately. After a training battle with the U.S.S. Republic, the Enterprise receives an order from Starfleet to travel to Pollux V. The colonists on that planet report being attacked near their mines by creatures that resemble mythological demons. An Enterprise landing party encounters a group of Klingons, who, after being disabled, turn out to be androids. A gate in the mountain leads to a hidden chamber where the Nauians, the original inhabitants of the planet have remained in stasis during a recent ice age on Pollux V. A safety system of that installation was responsible for artificially creating android guardians based on the greatest fears of whoever came close to discovering the chamber. The stasis systems were programmed to wait for the next eclipse, which never happened as the moon had been destroyed in the meantime. After Kirk manually terminates the stasis and establishes peaceful contact with a Nauian representative. The first episode in the game provides a straightforward, if interesting story. It manages to establish that the story takes place in the Star Trek universe by incorporating various known elements (Tellarites, Klingons (albeit not real ones), ...) without obsessively clinging to the shortcomings in terms of storytelling and production techniques that TOS sometimes suffered from. For instance, the first unknown alien lifeform appearing in the episode, the Nauian, is decidedly non-humanoid. Moreover, the motivation seems more credible than the usual plot-device-of-the-episode that needs to be fetched from a particular planet, as for once, the Enterprise travels to a Federation world simply because the inhabitants have a particular problem that they want Starfleet to deal with. Also, it is a refreshing change that the colony is not another nondescript standard colony, but actually something like a monastery, which gives the colonists some distinctiveness. Overall, the episode feels a little bit bumpy, which may have to do with the fact that the direction of the story seems to change quite often in only very few locations. At the same time, the score relies very heavily on TOS's "effect" music. Other than that, the dialog with the Nauian in the end appears a bit drawn out, as it is made excessively clear that the Nauians happen to be monotheistic and open toward other monotheistic religions, making them a perfect match for the colonists already on the planet. This could have been toned down a bit. The other dialogs with the crew, including the final banter between Spock and McCoy about demons, feel very natural. The ice age on Pollux V was reportedly caused by asteroid impacts, which also caused the destruction of the planet's moon. With that in mind, it is questionable why the Nauians chose a solar eclipse as the signal for leaving stasis, given that the moon was in some risk by the asteroids, and that the end of the asteroid barrage would hardly be coupled to the eclipse. At the same time, waiting for the eclipse did not seem to have an overly important religious meaning to the Nauians, as the one Nauian representative we see immediately thanks Kirk for being awoken and has no qualms about the symbolic meaning of the lack of the eclipse. The process of adding a new member to the Federation is made to appear ridiculously informal and simple: Right after waking up (and apparently without any contact to others of his people), the Nauian asks Kirk for membership in the Federation, whereupon Kirk swiftly says he accepts the application for membership and will have a diplomat sent to make the "final arrangements". There is only one key for disabling the guardian mechanism, and it is a tiny piece of metal that is kept outside of the sleeping chamber (as it was found by one of the acolytes before the door to the chamber had been opened). Without that key, the Nauians would be subject to the guardians just as much as intruders from the outside. After waking up, the Nauian knows immediately who everyone is. He knows about factions such as Klingons and the Federation, even though none of these can have been around at the time the Nauians went to sleep, given that non-sleeping Nauians devolved into cat-sized animals during the ice age. Nitpicking: A long cave with lamps at the ceiling leads into Mount Idyll. This must be the entrance to the mines the colonists spoke of, so it must have been built by the settlers. At the end of that cave, there is the locked door to the Nauian sleeping chamber. When it opens, the cave and the lamps behind the door look exactly the same as the first cave, even though these must have been built by Nauians. Curiosities: The characters seem remarkably undecided on the nature of the guardians. McCoy describes them as an "organic construct", as well as an "android-like robot". Later on, Spock manages to "repair" "circuitry" and "machinery" in a severed guardian hand. Continuity: When Kirk asks Uhura whether any disruptor fire was registered on the planet's surface, she immediately asks whether Klingons are involved. Given that during TOS, Romulan disruptor sidearms had not yet appeared (and were thus unknown to Starfleet), this seems reasonable. Remarkable faction: The colonists belong to a religious group called the "Acolytes of the Stars". They do not seem to share a common mythological background (as evidenced by the Tellarite Brother Grisnash seeing guardians as Tellarite wolf-shaped Krognik-demons); their connection appears to be on a meta-level, as they all believe in a higher being. Remarkable error: During the initial briefing, the admiral mentions natives of Pollux V, but in the following, it becomes clear that she is talking about colonists, and that there are no known sentient natives on Pollux V until the discovery of the Nauians. Remarkable screen: The colony looks quite idyllic, situated in a forest on what seems like a sunny winter day, with some piles of snow lying around and birds chirping. Remarkable quote: "Federation scum!" (fake Klingon) Non-TOS Klingons would never have bothered with insults in English. Remarkable ship: The U.S.S. Republic is depicted as a Constitution class vessel, currently commanded by a Captain Patterson. Crew losses: Optionally, one redshirt, who can either get shot by a fake Klingon (unless the Klingons are disabled in time) or crushed by a tumbling rock while saving Kirk (if the player does not choose wisely in which order to vaporize a pile of rubble). The Enterprise is told to travel to Beta Myamid, where contact to the U.S.S. Masada has been lost. After arriving in the system, the Enterprise is attacked by a vessel of the Elasi pirates, who have captured the Masada. An away team manages to overpower the Elasi aboard the Masada. This episode prominently features the Elasi pirates, an additional faction introduced by the game. In hindsight, it is not clear why no existing faction with similar characteristics, such as Orions, was used. In any case, using this faction gives the stories the freedom to show major incursions such as hijacking of starships without making them political issues between the Galactic superpowers such as Klingons or Romulans. Little becomes known about the motivation of the Elasi pirates, although they appear to be more than mere thieves and rather come across as a kind of separatist group. The Elasi captain states the Masada had been taken to broker the release of 25 captured Elasi, and he calls the Federation "Imperialists" at one point. Still, it does not get clear what the Elasi have been waiting for, as they have locked themselves in the bridge (that seems to be surrounded by an additional forcefield to prevent beaming onto the bridge even if the ship's shields are lowered) and make no attempts to escape the system. Moreover, they have set up booby traps in the ship, as if they were intentionally waiting to be boarded by the enemy. In general, the story is pretty straightforward again, and more action-heavy than the previous episode. In turn, it doesn't feature any new revelations once it is clear the Elasi have captured the ship. Remarkable ship: The U.S.S. Masada, a ship of the Ptolemy class from Franz Joseph's Technical Manual. The computer describes it as a tug/tender, NCC-293391. It is commanded by Captain Kevin Keeler and has a crew complement of 17. The Masada has a Constitution-like saucer, with what looks like a bridge module on top. On the other hand, the away team arrives in a transporter room, walks out of the door into a long corridor, and allegedly, the bridge is right behind a door at the end of that corridor. The away team beams themselves from the Masada transporter room onto the Masada bridge. This is in contrast to the ban on ship-internal beaming on TOS. Maybe transporter systems have just been upgraded shortly prior to the episode, though. Continuity: The Enterprise crew use the command prefix codes to remotely lower the Masada's shields. The same tactic would be applied to the U.S.S. Reliant in TWOK. If, as the computer claims, the primary mission of the Masada is towing/repairing of disabled ships, what is it doing all alone in the Beta Myamid system? The Masada has an oddly anachronistic 6-digit registry number (NCC-293391). Crew losses: Optionally, one redshirt, if the Elasi are not disabled in time. Also, the Masada's crew complement is 17, according to the computer, while Spock reports 27 lifesigns on the Masada. We see 9 crewmen in the brig, and one more in the transporter room. Furthermore, we see two Elasi guards in the brig and four Elasi on the bridge. The remaining 11 people must be elsewhere on the ship, and it is unclear how many of them are Elasi, and how many of the remaining 7 crewmembers survived. The Enterprise is sent to ARK7 near the Romulan neutral zone, as Romulans have shown up near the research station where Dr. Carol Marcus conducts experiments. The airborne Oroborus virus that is dangerous to Romulans has been accidentally set free on the station. McCoy manages to synthesize a cure for the virus, and the Romulan intruders on the station are cured. This episode features a similarly straightforward retake-captured-vessel plot as the previous one, but the action feels better embedded into the story. Somehow, the technical difficulties the crew encounters come across as less contrived than in the previous episode. This may also have to do with a slightly larger amount of information being available in the library database on the station than what was provided in previous episodes. Moreover, the ending feels comparably rewarding, as the Romulans can be cured and call of their attack. Moreover, we get to meet Carol Marcus (and her colleague Dr. Cheevers), although there is not much interaction with her in the end. At the same time, however, everything presented does seem a bit incomplete, as it is hardly believeable there are only the two scientists on the station. While the previous redshirts that joined the away teams were rather quiet, this episode brings us Lieutenant Ferris, who occasionally throws in some snappy remarks almost on par with McCoy's outbursts. It is nice to see some different personalities in the security details, which gives them a little bit more to do than serve as an optional casualty for cases when the player is not careful enough. Remarkable station: ARK7 looks like an expanded and more colorful version of space laboratories like Regula-1. Its interior does not look distinctively Starfleet-like, maybe also as a contrast to last episode's Starfleet-styled interiors of the Masada. Remarkable fact: TLTDH gas (Tantalum Bi-Lithium Thalo-Dihydroxide) acts as a laughing gas on Vulcans and Romulans. Remarkable retroactive foreshadowing: Dr. Marcus's lab contains a large cylinder, which, according to Spock's tricorder readings, houses over ten million forms of life. Carol Marcus says she calls it "the cradle" and hopes "something wonderful will be produced" from it one day. After fending off an Elasi attack on a scout ship, the pilot of the scout ship turns out to be Harry Mudd, who has taken over a derelict ship originating from the extinct race of the L'Shaians. Apparently, the Elasi are after the origin of some artifacts from the alien vessel, which can be used as weapons. Soon, the away team finds out the alien vessel was a warship with advanced weapon technology. With the Enterprise temporarily under attack by Elasi pirates, the away team manages to reactivate some of the aliens' systems. However, Harry Mudd accidentally erases the database of the vessel, meaning that all knowledge on the culture of the L'Shaians is lost. The episode starts out much more light-hearted than the previous episodes, despite the opening battle against two Elasi fighters. This is underlined by the frequent use of the "funny" TOS music, essentially every time that Harry Mudd appears. While he remains fully in characters by claiming the alien vessel, and everything aboard, for himself, it does not get clear at first why the Enterprise away team tries to repair the alien weapon systems. It almost seems like they are acting on principle because they are dealing with Harry Mudd, not because they are trying to achieve a particular goal. Their actions only become understandable when the sensors are reactivated and the away team discovers more Elasi ships are attacking the Enterprise. Nonetheless, the "serious" part of exploring and reactivating the alien warship with its miraculous experimental weapon system and the "funny" part of dealing with Harry Mudd and the issues he causes somehow balance each other well and result in a satisfactory mixture. Only the ending comes a bit abrupt and leaves a rather bitter taste, given that the alien database is lost. In a way, though, it is only realistic that the away team beam back as soon as there is nothing more to do for them on the alien ship. Harry Mudd says after selling various of the items he found on the derelict alien vessel, the Elasi started asking where he was getting his goods from. Where they unable to simply follow his ship back to the wreckage after he had sold something? Even though the alien ship is of unknown origin, it appears to be subject to general salvaging laws. Harry Mudd insists everything aboard the ship belongs to him, as he has registered to have found the ship. It is questionable whether such a regulation could work out in open space. On the one hand, the originator of the vessel could be having quite a different idea about who drifting vessels belong to. On the other hand, this could easily mean Starfleet is unaware of whole civilizations even though their artifacts are already widespread in the Federation. More likely, the vessel would fall under certain provisions like those currently in place for antiques. In one of the rooms on the alien vessel, Spock comments on something that looks and works like a photon torpedo loading tube. He comments that it is "tied directly to the alien equivalent of our ship's phasers and photon torpedoes". Realistically, those two are two rather different systems, however, with phasers requiring no such thing as a loading tube. In the end, Kirk makes Mudd agree with donating 5 samples of each object found on the spaceship to research, and then leaves. It is unclear what happens afterward, as the away team leaves specifically because interferences from a nearby neutron star pose increasing problems to the Enterprise (but not to the alien ship?) and the alien vessel cannot move on its own due to extensive engine damage. Only the final note that Uhura arranged for Harry and Stella to meet on Starbase 7 implies there is some way Mudd will be made to travel to that starbase. Spock points out the Enterprise has to answer to the distress signal because it comes from a registered Federation ship. Kirk says, deleting the only known records of a perished race is a punishable offense. Remarkable piece of equipment: The Sav-a-Ship life support generator is a mobile unit used by Harry Mudd to maintain environmental conditions on the alien vessel. Spock says it is "not exactly a reliable model". Remarkable visual trick: While other persons that appear on the bridge viewscreen are usually clearly visible, Harry Mudd's face is in the dark in front of a brightly lit background. Presumeably, this was deemed preferrable over a well visible, but unrealistic drawing of the character. Continuity: Kirk asks Mudd how Stella is, whereupon Mudd answers: "That was a dirty trick, Kirk! ", referring to the events at the end of "I, Mudd". Remarkable ship: The alien vessel, which was declared by Harry Mudd to be a "passenger tug". Remarkable technobabble and handwaving technology: Spock believes some cylinders in the alien vessel are "self-referencing packed-quantum cartridges". The redshirt Lt. Buchert seems to understand it means they are "powerboosters". According to Spock, they boost an infinitesimally small amount of energy to levels comparable to a photon torpedo. Spock claims the machinery used to deliver the powerboosters is an engineering feat itself. However, what we see is a simple robotic grappler dangling from the ceiling as it exists today. Spock and Kirk agree the universal translator is not available to them as the Enterprise is out of communication range. On no other occasion has this ever been a problem for the universal translator. McCoy says the L'Shaians' eyesight was almost 360° around, based on their six eyes. However, the picture from the database shows all six eyes were on the front side of the head. The alien-looking and yet uniform interiors of the alien vessel. We get to see a cargo bay, a weapons control room, a sickbay, a computer control room, and a bridge, all reflecting a repeated occurrence of numbers 6, 3, and 12. "It would be worth our effort to locate the central databanks for delivery to the Kornephoros Life Sciences University, I believe." - "To say nothing of fulfilling our mandate to seek out new life and new civilizations." (Spock and McCoy). This is one of the somewhat rare occasions where new discoveries are not just left for themselves after the initial contact, but are implied to be further analyzed by more specialized departments. Remarkable alien species: The L'Shaians are visible only on a picture from the database. They are green-skinned and possess three pairs of eyes, as well as six fingers on each hand. Stardate: 5097.3: The Enterprise travels to a planet near Klingon space, as Klingons have entered Federation space to search for a criminal. After coming to an agreement with Klingon commander Taraz to find the alleged criminal within 12 hours, a landing party encounters a man with supernatural powers who claims to be the Aztec god Quetzalcoatl. Quetzalcoatl does not believe his actions have endangered peace and, in a fit of rage, transports the landing party into a dangerous forest. By the time they make it back to him, he sees the Enterprise crew are worthy of his trust and realizes as his intentions with the peoples he has visited did not come true, he does not deserve to have the god-like powers he possesses. He asks the Enterprise crew to remove a gland responsible for his powers and his immortality. However, due to his interference in Klingon space, he is considered subject to Klingon law and has to be tried on Krakkour. When it becomes clear that the Klingon Admiral Vlict Kenka is trying to cover up his genocide on the population of Krakkour by punishing Quetzalcoatl as a scapegoat, the landing party is transported into a subterranean labyrinth, where they find the powerful native entity Bialbi. Bialbi declares Krakkour to be off-limits to Klingons and requires that Quetzalcoatl be released. This episode is quite captivating, not only due to its flow that spans two very different planets, but also because the multi-layered motivations of all involved parties are rather well explained. At first, it looks like the episode centers on Quetzalcoatl and the tests he puts up for the landing party. Then, the Klingons are in command, as is also decided by the Organians based on the current peace treaty, even though Kirk recognizes the Klingon admiral's perosnal motives. Finally, all parties involved get confronted with the entity Bialbi. Interestingly, Bialbi points out that Klingon archeologists had come close to its subterranean hideout. Beside this being one of a few rare cases where Klingons are mentioned who are not warriors, it is left open who built the control center around (the non-corporeal?) Bialbi, or who it was built for. With this said, Quetzalcoatl is rather quick to accept that his original intentions have not led to the desired outcome, and thus to completely neglect his supernatural powers. It seems as if he had just been waiting for an excuse to honorably get rid of the supernatural gland. Also, he makes a point about humans not possessing the gland, implying that his species usually does. Are there more of his species, and if so, how and where do they use their powers? Overall, however, this is still the most serious episode in the game so far. Fittingly, it does not end with the usual McCoy-Spock bantering, but with a more contemplative musing of Kirk that it did not end well for the dead on Krakkour. Remarkable spelling oddity: The game consistently spells "Quetzalcoatl" as "Quetzecoatl". I could not find any references using that spelling and Google thinks it is a typo that should have been "Quetzalcoatl". The transliterated Klingon spelling of the name is "K'etz'koatl". Nitpicking: Krakkour was purposefully destroyed by the Klingons, yet the court hall and the underground test-of-life facility are still usable. Kirk points out that Quetzalcoatl was one of the most blood-handed gods in human history, to whom hearts of sacrificed humans were offered. However, only some legends describe Quetzalcoatl as being in favor of human sacrifice, while he is opposing it in others. After the TAS episode "Beyond the Farthest Star", this is already the second installment in Star Trek that has the ancient god Quetzalcoatl appear. Remarkable character: Tlaoxac, priest of Quetzalcoatl, in full Aztec warrior equipment. Spock says his nerve pinch is unlikely to work on a massive warrior like Tlaoxac. One of the crimes Quetzalcoatl is charged with by the Klingons is "impersonating a Klingon". Remarkable overreaction: Quetzalcoatl's teachings of peace on the Klingon world Krakkour were deemed so dishonorable by Admiral Vlict Kenka that he ordered to kill all life on the planet with heavy bombardment and intense doses of neutrino rays. Remarkable scene: At one point in the forest, the landing party have to cross a river over a fallen tree. If one is not careful, Lt. Stragey will be pulled into the river by a huge tentacled monster. Remarkable location: The Klingon courtroom on Krakkour is a mix of "old" and "new" Klingon style. It features a large rendition of the Klingon emblem known since TNG on its floor, while the Klingons are, as always throughout the game, TOS Klingons. All of this is in front of the ruins of Krakkour in a thunderstorm. Continuity: One of Kirk's dialog choices when explaining the actual results of Quetzalcoatl's influence on Earth refers to these possibly undesirable outcomes as being one of the primary reasons of the Prime Directive. So, Kirk at least knows in theory. The Enterprise is sent to Alpha Proxima to investigate unusual activity on an asteroid. The pre-warp inhabitants of Proxima III call the asteroid Scythe and interpret it as their god of war. In fact, it is an old missile base involved in a war that took place on Proxima III a millennium ago, which destroyed most of the planet's civilization, and much of its technological progress was forgotten. While the landing party is trying to disable the ancient missile base on the asteroid, the engineering staff on the Enterprise is trying to get rid of a computer virus. The episode starts with a sound background story, even though it appears somewhat formulaic, with the two ancient superpowers favoring individualism and communitarianism, respectively, which is apparently meant to mirror something like the divide between capitalism and communism on Earth. In any case, the rift between the two cultures must have run very deep, as they even favored different radices in their mathematics (3 and 4, respectively). In this case, it was the individualist Lucrs that installed missile bases (on the asteroid) to keep their opponents subjugated. During the episode, however, the background story mostly serves as a foundation for various of the tasks the crew has to solve while acknowledging base 3. This is the first time in the game that a plot element actually gets recycled. After we have already seen a system that heavily relied on timed events, but measured time based on external factors rather than internally, we now see the ancient Lucrs were not any smarter than the Nauians. Rather than waiting forever, in this case the missile base misinterpreted 1000 years for a week. Come to think about it now, such a system design makes even less sense - imagine if your ink-jet printer counted days for starting its self-cleaning routine by registering daylight. The ink channels would completely dry up if you kept the printer in the basement! The computer says the asteroid Scythe used to be a moon of Proxima III (pushed out of orbit during the war), and it must have been quite a massive moon. From space, the asteroid looks like a planet with bodies of water, and there is a breathable atmosphere on its surface. Still, the surface looks impressively exotic within the restrains of the game's graphics. It uses the TOS sound effect sometimes heard on uninhabited planets, combined with the slightly menacing music theme, which results in a convincing alien world mood. As the asteroid has an orbital period of 200 years, it has passed by Proxima III several times since the war, but this time, it registered unidentified radio waves from the planet for the first time, which triggered the missile base's activation. The final solution is "minimally invasive", in that the missiles still get launched, but at an incorrect time, so they will run out of fuel before they reach Proxima III. It seems, however, like this is the best the landing party can do for the moment, as the asteroid is worshipped as a god by the inhabitants of Proxima III and can thereby not be destroyed without violating the Prime Directive. In general, the Prime Directive plays quite a role in this episode, and it is interpreted in a very different fashion than in TNG's "Homeward". Even though the inhabitants of Proxima III are subject to the non-interference clause of the Prime Directive, the Enterprise is supposed to save their world from whatever might happen due to the asteroid. About 1000 years ago, the civilization of Proxima III largely destroyed itself in a devastating war. 3/4 of the population died. Meanwhile, they have arrived at a stage similar to Earth's 20th century again. The memory of the war was transformed into the mythological basis for a religion, in which the war god Scythe was the only surviving deity. Parts of the planet are still highly contaminated by radioactive weapons. The two warring factions were Lucrs (who put individualism and own effort above all) and Sofs (who were strongly focused on the well-being of the community). Curiosities: The Lucr computer virus can be defeated with a Klingon anti-virus software. While it is in line with other Star Trek installments, it does not get any more credible that a sensor sweep could infect the ship systems with a virus. The hatch leading to a highly radioactive area in the Scythe missile base is marked with a Terran radioactivity warning sign. Highly improbable. The Enterprise finds the destroyed U.S.S. Republic. Sensor records and the last surviving crewmember indicates the Enterprise had destroyed the Republic. The attack was conducted by the Vardainian Dr. Ies Bredell, who has managed to build an exact copy of the Enterprise to take late revenge on Kirk. The episode starts out with finding the wreckage of the Republic and almost everyone aboard dead. The mood remains accordingly somber throughout the episode, and the devastated interior of the Republic with debris and bodies lying around everywhere convincingly conveys the work of a ruthless aggressor. While the desperate atmosphere is credible, it must be noted that the episode relies a bit much on common clichés. A completely devastated starship that is still intact enough for a landing party to walk around without spacesuits, a single survivor (who, how else could it be, is a former acquaintance of Kirk's - at least not an old flame of his, or maybe it was just not explicitly mentioned) who dies shortly after uttering some hints relevant for the plot (if we discount the red herring of the two survivors, one of which dies moments before the landing party arrives), an opponent obsessed with taking personal revenge and who has the means to somehow create an exact copy of the Enterprise, a fake distress call as a decoy to lure the Enterprise away - we have all had that before in one form or another. This way, the story is not overly intriguing and the focus lies on the operational details of getting various parts of the ship to work, such as dysfunctional doors. When the main story is driven forward, it does not appear to be very focused. First, the Elasi want information about the 25 Elasi prisoners they already tried to free when capturing the Masada in "Hijacked". Then, Bredell turns up out of nowhere, trying to execute his revenge plan. But where has he been all the time? It seems he specifically wanted to destroy the Enterprise together with Kirk, but only if the other Elasi did not kill Kirk first while trying to extract the information about their captured comrades. Bredell's background story does not become very clear, anyway. We learn that Kirk, while serving as a Lieutenant on the Farragut ten years before, helped expose "unethical practices" that Bredell was involved in. That, along with the fact that Bredell is referred to as a "doctor" and therefore must be a mad scientist, is apparently deemed to suffice to viewers. As an additional tidbit, Bredell is depicted as some sort of a cyborg with metal covering a part of his head and an artificial eye blinking in a menacing red. I would rather expect such an opponent in a non-Star Trek comic serial or maybe the Abramsverse, but not in any of the "old" Star Trek installments. Lastly, it is rather a letdown that the mission (and the game) ends by destroying Bredell's Enterprise-2. After several episodes where space fighting either did not occur at all, or was placed at the beginning of the story, making the final episode end with a decisive battle against an opponent that was barely introduced when the battle started, this ending feels too abrupt. Character-wise, it is at least nice to see that, after the redshirts have steadily been somewhat vocal in one way or another (in contrast to the TV redshirts who often had very few or no lines), Ensign Kije even gets to be the hero in one aspect of the story, as it is him who beams to torpedo control and fixes the loading mechanism off-screen while reporting his progress. When the landing party find out the Republic's computer core cannot be repaired without a starbase, McCoy says they did not bring a spare M-5 computer. Either, the flaws of the M-5 have been fixed since TOS: "The Ultimate Computer", or McCoy was not aware that particular type of computer did not work as expected. After all, he's a doctor, not an engineer. Bredell talks about building "our own Constitution class starships", which must have been happening in secret. Can a single Federation world really do that without any outsiders taking note? If anything, it must be an extremely reclusive world. Nitpicking: The landing party uses turbolifts on the Republic. Apparently, Constitution class vessel really have no staircases for use in case of fire (or otherwise heavy structural damage). Casualties: The entire crew of the U.S.S. Republic, including Captain Patterson, first officer Andrade and Kirk's academy classmate in alien history, Brittany Marata. The main engineering of the Republic is a modification of the Enterprise's main engineering: It prominently features the two large consoles with the steep ladder and the "balcony", but behind the balcony, the long reddish tunnel is visible, which is on the right side on the Enterprise. On a side note, a locker in main engineering acts as a bookshelf for engineering journals. The auxiliary control room of the Republic looks like a simplified bridge with a slightly smaller main viewscreen and less consoles at the walls. Remarkable log entry: While Kirk is describing that the Enterprise is tracking down the ship that destroyed the Republic, he is interrupted by Spock, who comments on Kirk's choice of words. This log entry is not a voice-over, Kirk really seems to dictate it to the computer on the bridge. Remarkable ship: The Enterprise-2, an exact copy of the Enterprise, including hull markings and transponder codes. It fires what looks like Romulan plasma torpedoes. 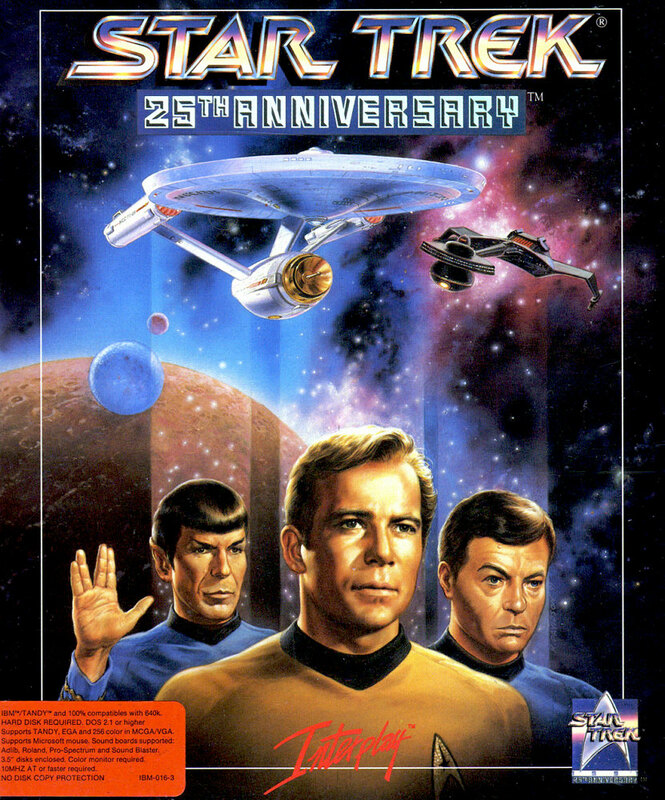 25th Anniversary is a satisfactory experience, both in gameplay and storytelling. To some extent, it shows that the simplistic TOS style can be merged with more modern visuals. The TOS sound effects were a bit overused at first, but got toned down to an enjoyable level as the episodes progressed. The episodes were rather very short and thus could not reach the depth of TV episodes, but nonetheless did not feel rushed. Only the invariable combination of the landing parties, consisting of Kirk, Spock, McCoy, and a security officer (at least a different one every time!) was a bit repetitive, but that was fixed for the game's successor, Judgment Rites. Gameplay-wise, the game provides a viable variant of common point-and-click control interfaces. Interaction with characters usually felt natural, and seeing Star Trek items such as tricorders or phasers in the inventory conveyed a true Star Trek feeling. Also, having Kirk or the others look at objects and scan them with the tricorder often provides interesting background information on the environment. The space battles thankfully seemed somewhat realistic, as well, with weapons being restricted to phasers and torpedoes, as opposed to the elaborate fantasy weapons other more combat-oriented Star Trek games tend to invent. Given that the obligatory battles were rare and sufficiently simple to master, they also did not bother me too much as a distraction from the story-based adventure parts. The only exception was, as noted above, the final battle against Bredell and the Elasi, which could not even be rescued by giving orders to the familiar characters from TOS on the bridge. Speaking of which, the game is sufficiently embedded in the Star Trek universe, although it fulfils barely more than the minimum requirements for that. The seven TOS main characters (Kirk, Spock, McCoy, Scotty, Uhura, Sulu, Chekov) appear, but secondary characters that could be aboard the Enterprise such as Janice Rand, Christine Chapel, or Doctor M'Benga are not even mentioned. This may have to do with the fact that, aside from the bridge and the quick (non-interactive) glances in the transporter room, no scenes in the game play aboard the Enterprise. At the same time, guest characters who are not supposed to be on the Enterprise (Carol Marcus, Harry Mudd) just show up a reasonable amount of times, as accidentally running into familiar persons all the time would be rather contrived. Lastly, while the Klingons and Romulans, as well as some other Starfleet ships appear, all other planets and civilizations are entirely new. This is not necessarily a shortcoming, but if the game consisted of more episodes, it would be desirable to further strengthen the ties to the established universe with more than just the few most prominent characters and races known from TOS.